Harbhajan was the best bowler for the hosts with the figures of 4-1-17-2. In a brilliant spell, he bowled a maiden and grabbed two wickets, including that of the 'universal boss' Chris Gayle. 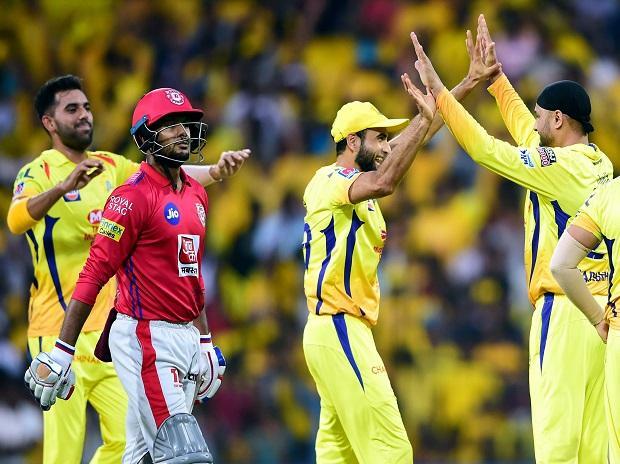 In Match 18 of VIVO Indian Premier League (IPL 2019), Chennai Super Kings (CSK) spinners led by seasoned Harbhajan Singh put on a dominating show to help the side reclaim the top position in IPL points table 2019 with a 22-run win over Kings XI Punjab (KXIP) at MA Chidambaram Stadium in Chennai on Saturday. Defending 160 for three, CSK restricted Punjab to 138 for 5 despite half centuries from K L Rahul (55) and Sarfaraz Khan (67). The visitors scored at a snail pace and required to score 26 off the last over, bowled by IPL debutant Scott Kuggeleijn. The Kiwi paceman had no trouble defending those runs and also dismissed Sarfaraz. Ravindra Jadeja (4-0-24-0) and Imran Tahir (4-0-20-0) also helped CSK put the brakes on the rival batsmen. They, along with Harbhajan, conceded only 61 runs in 12 overs even as the required run-rate kept mounting. Kuggeleijn did not start very well, being hit for a six off his very first ball, but did well to finish with 2 for 37 in his 4 overs. Harbhajan struck a huge blow to rivals by dismissing the Gayle, having him caught behind by M S Dhoni for 5 in the second over. Two balls later, he had the stylish Mayank Agarwal, caught by Faf du Plessis near the boundary with the batsman going for a big hit. Harbhajan started off with a double wicket maiden to put Kings XI on the backfoot early. In the 13th over, Rahul's missed sweep saw Dhoni flick the ball on to the stumps but the bails didn't come off though the LED lights lit up, ensuring the batsman survived despite being short of his crease. The century partnership for the third wicket between Rahul and Sarfaraz was a productive one but they consumed a lot of balls and stymied the Kings XI chase as the CSK bowlers kept things tight. 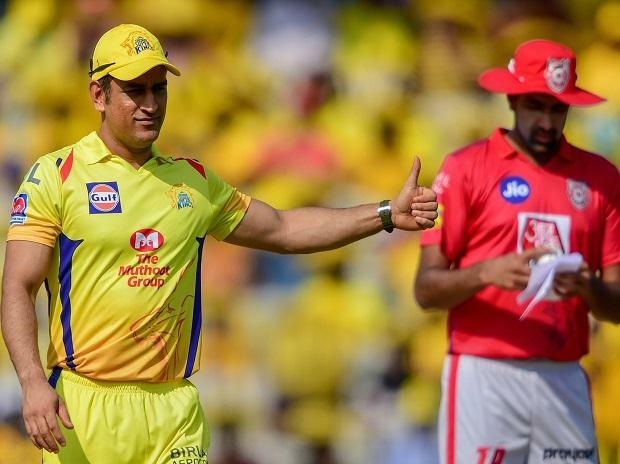 Earlier, du Plessis hit a fine half-century up the order while skipper Dhoni and Ambati Rayudu provided the late flourish to help Chennai Super Kings post a competitive 160 for three. Du Plessis made 54 off 38 balls with the help of two fours and four hits over the fence and together with Shane Watson (26) added 56 runs for the first wicket after opting to bat. But it was some late hitting by Dhoni (37 not out) and Rayudu (21 not out) and their unbeaten 60-run fourth wicket partnership in 30 balls helped the defending champions reach a respectable total. Thanks to Dhoni and Rayudu, CSK scored 52 runs in the last five overs after a rather quiet middle period. Kings XI skipper Ravichandran Ashwin was the best bowler for the visitors, picking up three wickets for 23 runs from his four overs. He was on a hat-trick in the 14th over after getting half-centurion Du Plessis and Suresh Raina off successive deliveries. Watson fell against the run of play, attempting a big shot off Kings XI captain Ashwin to be well caught by Sam Curran in the deep. Raina (17), who came in at No.3, strung together an useful 44-run partnership with Du Plessis, who kept the scoreboard ticking with a mix of attacking shots and judicious running between the wickets. The partnership was broken when Du Plessis perished while going for a big hit off Ashwin, caught at long-on by David Miller and then a ball later the off-spinner cleaned up Raina as the batsman went for a sweep.